I will admit I am not the most conventional in the box type person. My dogs must all have what I want to hunt behind or trial behind. Though I personally run National Shoot To Retrieve I seek much of the very same things other trialers do. Fast moving dogs that have finding birds as their agenda. I will not use dogs that are gun shy or fail OFA or that severely lack in what it takes to be a solid good bird dog nor will I use dogs that required medical attention for certain things Like Valley Fever, mange demodetic or scarcoptic types ..Reason being if they need to be treated for these things which are just a part of life it is a sign of a suppressed Immune system as dogs with strong immune systems will naturally keep these things in check. My reason for not using gun shy despite what people may think excessively soft dog with low to no prey drive dogs will not have what it takes to get over poor introduction to the gun if human caused or those dogs that are just naturally afraid of life in these dogs generally display a lack of desire in the field. A dog that has been made gun shy and still likes birds and still hits the field hunting can be retrained to not be gun shy and be good bird dogs thus they have what it takes to be in the field. For me and my program Brittanys are supposed to be bred to be Bird dogs and those dogs that lack desire in the field have no business to be in the gene pool. Dogs that may have the greatest pedigree one could dream of , if the dog doesn't measure up with the basic fundamentals for being a bird dog able to hunt with desire and stamina for a good days hunt again this dog has no business being in a gene pool. Show is nice but if a dog doesn't have what it takes to be a bird dog I do not care how pretty it looks or the standards it falls in if it the dog doesn’t have the basic fundamentals for the field how can we say that is doing the breed any justice we should be seeking and pressing the judges to Look for those dogs that are built and in shape showing that truly functional type dog. But this argument has been going on for over a century. I was just reading a google book the other day by Ed Laverack written in 1872 who had the same concerns with the shows and the bench setters back then and what he saw as a detriment to the breeds back then. 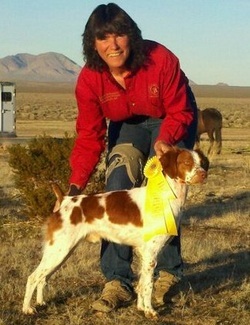 So with that Yes I do care very much about my Brittany’s and yes I will step out of the box to bring in and maintain those traits which will help maintain the functional bird dog in our Brittany. Through Mikey I learn about field trials , I went to check different formats out I will admit my first intro to the AKC format I didn’t meet the right people to start and that left me with a bad impression of that format and the people. I have met some other wonderful people since and got over the Bitter beer face that my first intro left me with. So remember when checking formats out try not to fall in the same pit I did allowing the people to sour me out on a format. And another thing we also have to remember that We need to band together and support each other in the venues we elect to run, we will end up none of us will be able to play in time honored traditions. On the trials I then went to a National Shoot to Retrieve trial and found that format to be closer to what I was doing with my dog. Watching I was telling myself Well my dog does that…My dog can do that and as a handler shot and missed I bird and I watched the bird fly off I said well Hell I can shoot like that with a little chuckle. So that was it I finally got to run my dog and to make matters worse I got a first place on my first try..]Talk about getting hooked Hook Line and Sinker. I did learn at trials you really need to get a waterproof vest to let some of the words from certain people roll off your back. Had one guy tell me if I ever wanted to get anywhere in NSTRA I need to get a pointer as I will never get anywhere running a Brittany. I stood there scratching my head as I was holding my very first, 1st place plaque. Oh well granted I am not a Nolan Huffman but I have had a pretty good time running my dogs and haven’t done to bad 4x K Nine’s Blazin Bullet, 2x K Nine’s Beeline Bullet, 2x Tucalota Creek Picabo, 1x Truckers Wildthing and have had 2 dogs make the top 6 places for the AZ NSTRA state regionals 3 times and then have had a couple dogs make top 4 a couple more times above that. So, now as a breeder I do what I can to give a pup the best chances of being what they should be. I make sure the parents have the desired traits in the field on birds. And that they are sound to breed. I know Mother Nature has ways to remind us we are only human no matter what we try to do to try and prevent bad things from happening it is how we deal with it that makes a difference. We can’t correct the bad genetics in the one dog. We can replace with a newer pup and should the new owner not want the dog they have to take back the pup or allow the owners to keep and once the dog is altered and proof of that is provided then replace with a new pup. I may not be popular on this but I can only guarantee that I have done my best to produce healthy pups I do have a replacement should by 30 months old a dog fails OFA for those that have desired breeding in their future If the dog is Borderline or Mild and was purchased or hunting companion should the dog not be able to hunt till at least 7 years old I will replace but Borderline to mild the dog will more than likely Never show any or very little clinical signs till late in life. Moderate to severe depending on the dog again as I have seen most these dogs can hunt till mid-life and will need some intervention or has some other genetic issue which makes them unserviceable Depending on the goals for the dog is where I will work and help come up with a future plan that makes the bad situation as good as possible.